You are here: Home / Community / Update: Christmas Lights Display Smashes Fundraising Record! Update: Christmas Lights Display Smashes Fundraising Record! Wow! The Severns-Pease Christmas Display obliterated its previous fundraising record, taking in more than $84,000 between Thanksgiving and New Year’s Day in donations for a local food bank. Last year the display raised nearly $55,000. Dave Severns is of course well pleased that they were able to break the $80,000 goal he set for the season. I wrote about the display back in early December . Severns and his neighbor Andy Pease have been putting up the joint display since 1995, with each year getting a little more elaborate than the next. When Severns computerized the display in 2002, hundreds of people started flocking to see the magical show of lights and music. Some people suggested they charge a fee, but they decided instead to collect money and food for Second Harvest Food Bank of Santa Clara and San Mateo Counties. 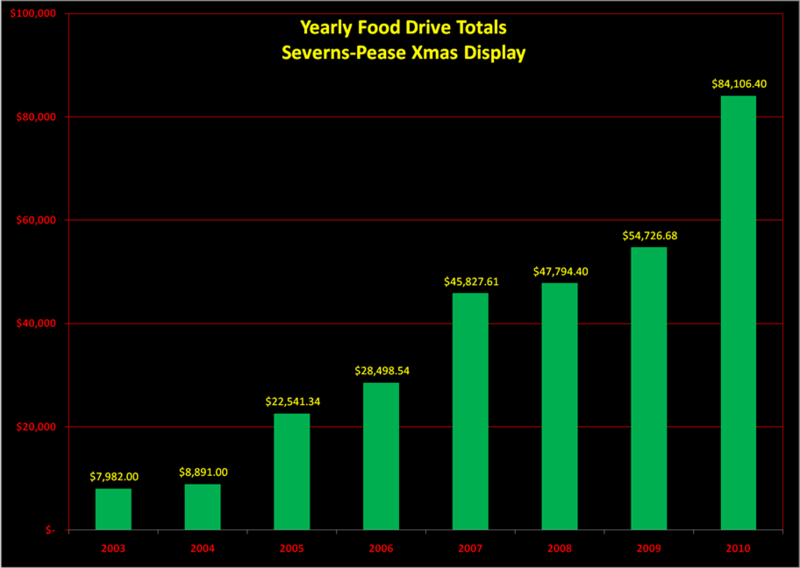 As Severns’ own chart shows, the donations have increased every year. With this year’s smashing fundraising success, it puts the display up with large corporations who have collected a million pounds or more worth of food for the food bank. It will be interesting to see what goal Severns sets for next year. In the meantime, congratulations to neighbors who made a big difference to the local community! The most popular post on Good Neighbor Stories is from two years ago .. The Christmas lights on Tangerine Way went dark when Dave Severns passed ..
Good Neighbor Stories Virtual Holiday Food Drive – Help Us ..
Good Neighbor Stories is proud to announce our first virtual holiday food ..